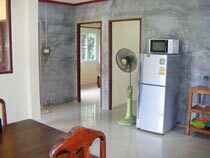 The houses of Nick-Nan House are designed for long term rentals of 1 year or more but even though not really suitable for holiday makers, since you have no service, towels and no or little crockery, the houses can be rented from minimum 1 week if they are available. 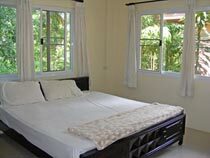 For short term rentals towels can be provided. At the small road is a little restaurant, which provides typical Thai dishes. The beach is a 5 minute walk from the house. It is nice and sandy, but also shallow and with some corals. If you want a beach for swimming you go a bit further up the beach. 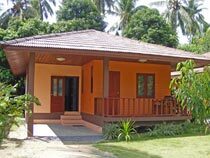 This two bedroom bungalow is located in the West of the island of Koh Samui in a very quiet area which is still fairly untouched by tourism. Here are no bars, big shopping centers, or similar things but the area is still pretty pristine. There are small restaurants and small shops with local assortment of goods. 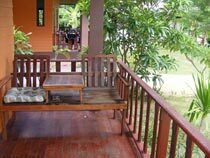 To Nathon it is a 15 minutes drive and Lamai with a lot of shopping facilities and entertainment of all kinds you reach within 20 minutes by bike. You can walk to the beach in 5 minutes. The beach is nice and sandy but shallow and there are some corals. If you want to swim you just walk a little bit along the beach. The resort has a small restaurant offering typical Thai dishes. The kitchen has a sink, a water cooker, a rice cooker, a microwave, a small open shelf, pots and pans and a fridge/freezer combination. 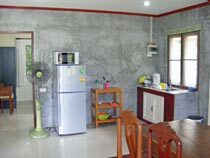 The living-dining area adjoins the kitchen and is furnished with a table and four chairs. From there you have access to the balcony with a bench and a small table. Opposite of the entrance are the doors to the two bedrooms. 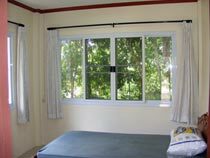 To the left is the smaller bedroom with a double bed, a wardrobe and a fan to generate a cooling breeze. To the right is the master bedroom with a double bed, a wardrobe, a dressing table with a mirror, a small shelf and an air conditioning. All windows have mosquito screens.